Evidence for the subjective exam. What evidence do we have the strength of the history in our examination? What information can we glean from it? How important is it in providing effective treatment? The prevalence of cancer within the LBP population is estimated at 0.7% and although this condition is rare clinicians can increase their confidence in screening for this pathology by following the evidence supported in the literature. Henschke, N. et al. conducted a systematic review on 6 studies of 5,097 patients and found a prevalence ranging from .1 to 3.5%. A previous history of cancer (+LR 23) and clinician judgment consistent with cancer (+ 12.1) offered the best shift in post test probability of cancer being present. Conversely, a patient younger than 50 years of age demonstrated a (-) LR of .34 for the presence of cancer. See Table. Further, Deyo, R. et al. demonstrated a four item cluster of age >50 years old, unexplained weight changes, a previous history of cancer, and no improvement with conservative care offered the best screening utility for cancer in patients with LBP (Sn 1.0, -LR .06 (0.0-.91)). In short, if a patient answers no to these historical items we can have increased confidence in our ability to rule out cancer as the source of a patient’s LBP symptoms. 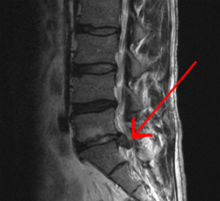 Infections in the spine including osteomyelitis, septic discitis, abscess, and shingles most commonly present secondary to a previous infection elsewhere in the body. 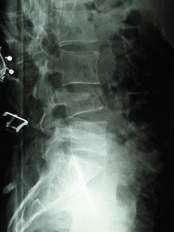 Infections known to cause spinal infection include IV drug use, skin infection, urinary tract infection, and skin infection occurring with an estimated prevalence of .01%. Symptoms of fever (>100 degrees), chills, malaise, and fatigue may be present concurrent with a patient’s LBP. 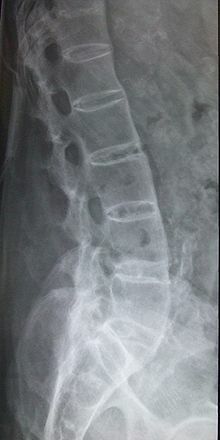 These infections in the spine are also commonly found in patients with a current or past medical history of immunosuppresion. Waldvogel, F. et al. reported on the diagnostic utility of the subjective examination in this patient population, of note is the lack of screening utility of the presence of fever in this population. See Table. One exception is for infective spondylitis with a positive response for fever offering a sensitivity of .98 and specificity of .50. ↑ 1.0 1.1 1.2 1.3 Freburger JK, Holmes GM, et al. The rising prevalence of chronic LBP. Arch Intern Med. 2009. 169(3):251-8. ↑ 2.0 2.1 2.2 2.3 2.4 Brennan, G. et al. Identifying Subgroups of Patients With Acute/Sub acute “Nonspecific” Low Back Pain: Results of a Randomized Clinical Trial. Spine. 2006. ↑ 3.0 3.1 3.2 3.3 3.4 Hampton, J. et al. Relative Contributions of History-taking, Physical Examination, and Laboratory Investigation to Diagnosis and Management of Medical Outpatients. BMJ. 1975. 2:486-489. ↑ 4.0 4.1 4.2 4.3 4.4 4.5 Deyo, R. et al. Cancer as a cause of low back pain. J Gen Int Med. 1988. 3:230-239. ↑ 5.0 5.1 5.2 5.3 5.4 5.5 Beckman HB, Frankel RM. The use of videotape in internal medicine training. J Gen Intern Med. 1994 Sep;9(9):517-21. ↑ 6.0 6.1 6.2 Shiri, R. et al. The association between obesity and low back pain: a meta analysis. Am J. Epidemiology. 2010. 171(2):135-154. ↑ 7.00 7.01 7.02 7.03 7.04 7.05 7.06 7.07 7.08 7.09 7.10 7.11 7.12 7.13 7.14 7.15 7.16 7.17 7.18 Moreley, S. Efficacy and effectiveness of cognitive behaviour therapy for chronic pain: Progress and some challenges. Pain. 2011. 152:S99–S106. 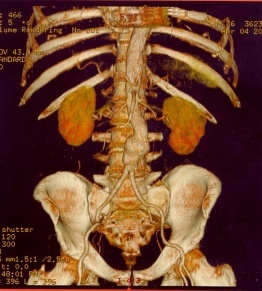 ↑ 10.0 10.1 10.2 Khan MA, van der Linden SM, Kushner I, Valkenburg HA, Cats A. Spondylitic disease without radiological evidence of sacroiliitis in relatives of HLA B27 positive patients. Arthritis Rheum 1985;28:40–3.